The Clover Club drinker is traditionally a gentleman of the pre-Prohibition school. He may not necessarily be one of the legal, literary, or business figures who were members of the club of that name. He may never have been in the bar of the Bellevue-Stratford Hotel in Philadelphia where the Clover Club members foregathered and the drink originated. But he belongs with that set. And switch from a Clover Club to a Pink Lady? Never! For one thing, someone might classify him along with that Pink Lady drinker down the bar. 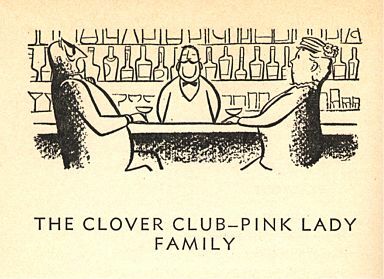 But while these captains of industry may have disdained the file clerks ordering their Pink Ladies, by the time Townsend penned The Bartender’s Book, the writing was on the wall–the Clover Club was becoming a woman’s drink. According to a survey of bartenders in the U.S. and Canada, conducted by the New York Bartender’s Union from approximately 1946-1951, the Clover Club had slipped out of its leather-and-oak gentleman’s club habitat and made itself a preferred drink among the post-War Carrie Bradshaws. Yet even with this gender switch, the Clover Club’s fortunes were sinking. Rated the 34th most popular cocktail in the survey–tied with the Tom and Jerry, below the Jack Rose, Rock-and-Rye and Milk Punch, and just barely ahead of other forgotten drinks such as the Paradise, the Horse’s Neck and the Gin Daisy–the Clover Club was reported as decreasing in popularity in the six years covered by the survey. Even with today’s growing interest in classic cocktails, it’s unlikely that the Clover Club will recover. For one thing, it contains raw egg white, which would seem to be the kiss of death for classic cocktails trying to make a comeback, with the possible exception of the Pisco Sour and, perhaps–and not without a heavy note of irony–the Pink Lady (disguised as “The Secret Cocktail” in Ted Haigh’s Vintage Spirits & Forgotten Cocktails). Aside from the young ladies at their infrequent soirees, the Pink Lady is drunk to some extent by the seekers of the gay life along the Great White Way. Somehow, to the boys who were brought up looking at the flamboyant circus posters on the side of country barns, a Pink Lady connotes something halfway between their early dreams of a lady acrobat in white tights and a scarlet woman. Fifty-odd years later, the Clover Club is little more than a footnote in cocktail history, appearing as an afterthought (or a prelude, as the case may be) when discussing its once-insolent, yet ultimately tastier and much more fun relative. Any more irony left in that shaker? Add ice and shake with studied firmness for at least 10 seconds. Strain into chilled cocktail glass and garnish with a stern glower. Add ice and shake with carefree exuberance for at least 10 seconds. Strain into chilled cocktail glass and garnish, of course, with a cherry. Thanks for the bit of history. I’ll have to try a pink lady at the very least. Trader Vic’s says they’re served in champagne saucers – when did that presentation come to be, do you know? I don’t know why he chose champagne saucers for this drink, but I can see his rationale–it certainly looks nice. I use this type of glass for cocktails on occasion, just for some variety in appearance. I wonder if, at the time, the champagne saucers looked more “ladylike” and demure than did cocktail glasses, hence more acceptable for women ordering a whopper of a drink. Just a guess, anyway. Hey Paul, I happen to work at the Bellevue in Philadelphia… do you think we should bring the Clover Club back? Simply substituting sour mix for the egg white and lemon juice? It might be fun for the nostalgia. Is sour mix still so prevailiant in the US ? If so,why is it used, for speed, effiency, economy ? Surely these reasons cant outweigh the difference in taste to the drink. Ive never used sourmix before, but i cant imagine going into the birthplace of such a classic drink, to have it made with sourmix, that would be harsh. And also, you cant substitute egg white with sour mix, sour mix will sweeten the drink, it wontbind the flavours or add any texture or mouth feel. I use eggwhite in alot of drinks, not all of them need it, and not all of them work with it. But some, simply dont work at all without it. having neither applejack nor grenadine, my version of the Pink Lady turned out quite well, using Cognac and Creme de Cassis. Thanks for resurrecting this classic cocktail. I will definitely try it at my home bar. Salute! where in the country can I find a Pink Lady and/or Clover Club when I travel? Anyone know a place? great post by the way ?? In 1880, Ambrose Burnside Lincoln Hoffman was a 14-year-old bartender at Bellvue-Stratford Hotel. Bartending was a noble profession and Ambrose had a gift for it. Family lore is that he won a contest at the Bellvue-Stratford by inventing the “Pink Lady.” I think we’ve figured out that he invented the Clover Club Cocktail, but our family historian (his granddaughter) remembers it as a Pink Lady–perish the thought. While the Clover Club cocktail might be “out of fashion” for the mainstream, I’m serving them at our next family reunion in honor of Ambrose. In 1880, Ambrose Burnside Lincoln Hoffman was a 14-year-old bartender at the Bellvue-Stratford Hotel. Bartending was a noble profession and Ambrose had a gift for it. Family lore is that he won a contest at the Bellvue-Stratford by inventing the “Pink Lady.” I think we’ve figured out that he invented the Clover Club Cocktail, but our family historian (his granddaughter) remembers it as the Pink Lady–perish the thought. While the Clover Club cocktail might be “out of fashion” for the mainstream, I’m serving them at our next family reunion in honor of Ambrose. Thanks for resurrecting this classic cocktail. My wife ordered a “bartenders choice” last night at Cotogna in San Francisco. She was rewarded with a Clover club cocktail with the ingredients described as “Gin, lemon, grenadine, and meringue.”excellent cocktail. I think the fear of egg whites is a bit overstated. Most bugs would not survive the alcohol and lemon juice in this drink.